October began with a kaleidoscope of colour stretching from ground to sky, as far as you could see, and it ended with grey horizons, bare trees, and cold winds, sometimes even snow. 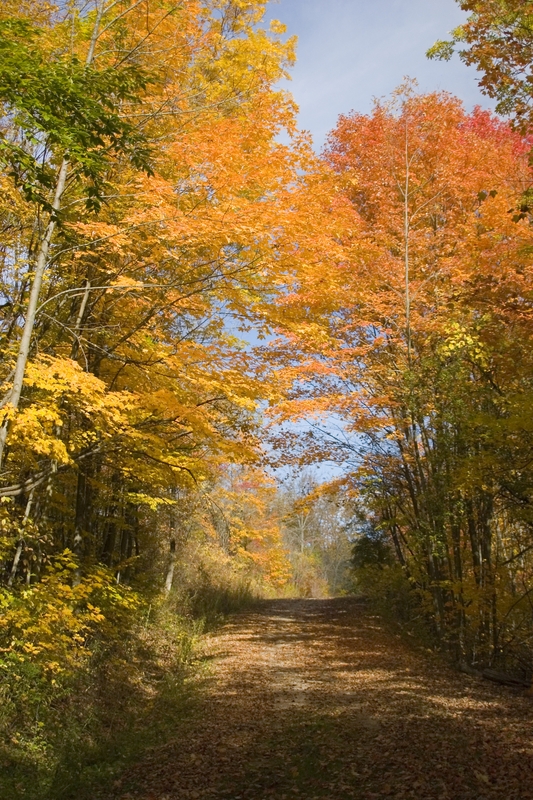 Although some of our trees turned just one shade of orange or yellow, many of them were ablaze with every hue from the palest yellow, the brightest orange, three or four different shades of green, to the bright, clear reds, all competing for attention, as they fluttered in the cool winds of autumn. The colours were so beautiful that often we would try to preserve them by waxing the leaves, and putting them between the pages of a book. Walking through our yard, I’d pick out the biggest and brightest leaves I could find. I’d seek out the perfect ones that hadn’t been torn by the winds, or chewed by insects. I’d try to get a nice variety of bright green, lemony yellow, and of course the stars of the show were the brilliant oranges, and rich, shiny reds. I’d bring them into the house, and Mother would get out her tube of waxed paper, the iron, and the ancient, battered, ironing board. That old thing had seen better days! We’d place each leaf between folded sheets of waxed paper, cover them with a tea towel, and press down with the hot iron. When we’d finished, I’d take my treasures, and store them carefully between the pages of a thick book, and place them on a shelf of the bookcase in the living room. Pressing the brightest leaves and saving them in a book was my way of trying to hold onto the season and make it last. It was the most colourful time of the year, and I wanted it to stay with us as long as possible. Of course like most things in life, it didn’t last, and bit by bit the north winds came, the nights grew colder, and one by one the leaves blew off the trees, and the cruel frost stole their colours away. Overnight, it seemed that our yard changed from a bright, happy carnival of colour, into a stark, eerie, cold and barren place, gloomy and silent, waiting for the onset of winter. It was during those final weeks of October that I’m sure we could have rented out our yard to a production company to film a spooky horror movie. The tall, imposing maple trees stood bare and dark, against the evening skies. Most of the birds had gone south for the winter, and so the yard was quiet……too quiet. The sun slipped down behind Mitchell’s barn earlier each night, and sometimes I’d be nervous walking up the lane-way, or back the side road. I rode my bike a little quicker, back from Cavanagh’s store; not just because the air was cooler, but because it was deathly quiet, and the leafless trees cast long, ominous shadows across the Third Line, as I made my way back home. Why did the places and things that seemed so natural and so comfortable a few short weeks ago, suddenly seem dark and ominous? I think it all boiled down to three things: heat, light and colour. Over the course of the eight weeks beginning in early September, to the last few days of October, we lost all three. It happened gradually of course; not all at once. The heat left first, and although the first part of September was almost like summer, it was as though someone was turning down a giant thermostat, a couple of degrees each day. The light left slowly as well, a minute at a time, over the days and weeks, then came the end of daylight savings time, and the light was reduced to a brief eight hours or so each day. The colour was the last to go, and hung on bravely until the frost came, and the leaves turned a murky shade of lifeless orange, and were so brittle that they could be crushed like egg shells. The transition from summer to fall that we witnessed each year might have seemed daunting, even depressing, to someone new to the area. Being Lanark County kids, we just took it in our stride, knowing that this, like our other three seasons, was only temporary. Dealing with the changing seasons, whether the change seemed like a positive, or negative thing, was a good lesson to carry with us in life. We learned to make the best of whatever was thrown at us. So every fall, as the winds grew cooler, and the dusk came earlier, our thoughts would turn to Hallowe’en. Our stark, colourless yards looked spooky anyway, so we made the best of it! We didn’t fret because summer was gone; we made the most of the new season, by making plans for the scariest night of the year! It was time to scrounge around in the attic, put together our best costumes, and get our candy sacks ready for that annual trek, up and down the Third Line! This entry was posted in Short Stories and tagged Arlene Stafford-Wilson, Bathurst Township history, Cavanagh's Store, Crafts for fall with leaves, DeWitt's Corners, Hallowe'en Lanark County, ironing leaves, Jack and Cathy Mitchell Bathurst Township, James and Helen Cavanagh DeWitt's Corners, Lanark County autumn, Lanark County Calendar Autumn Passages, Lanark county colours, Lanark County fall, lanark county history, Lanark County Tourism, Mitchell's Third Line, Pressing Leaves, Tay Valley Township weather, vintage crafts, Waxing Leaves. ← Lanark Museum – Genealogy Tips & Tricks Sunday, September 21st 2:00 p.m.